If you're creating a video podcast, the process is pretty much the same as an audio podcast. For the complete process, see my checklist for how to create a podcast. The main difference is that you'll need a video camera & video editing software. There are also a few more marketing angles you can use to promote a video podcast. Keep in mind that you can easily do both. A podcast doesn't have to be one or other other, but can be a combination of media files. See What is a Podcast? for details. There are a variety of ways to create a video podcast. You have your traditional "talking head" video where you record yourself talking or giving a demonstration. 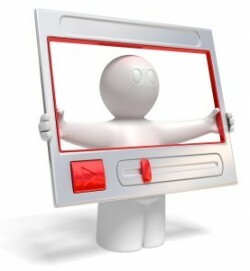 You can also create screencasts for things like software or web-based tutorials. There's also side-by-side Skype video interviews. Lots of options! In addition to the items on the checklist for creating a traditional audio podcast, you'll need a video camera and video editing software. I have a couple of inexpensive hand-held HD quality video cameras, similar to the Flip Video, which work great for shooting video on the go. Very compact and portable, and super simple to use. I'm currently looking at upgrading to a higher quality camera to set up in my home office. Not necessarily pro-quality (or pro-price) but a good high quality mid-range HD video camera that also takes quality still pics. So the first step is a decent quality HD video camera to shoot your video podcasts. And yes, the Flip or similar will work. I've even seen people record video podcasts via iMovie on a Macbook Pro. Tip: You want to record & publish your video podcast in HD format so make sure you have a camera that supports that. I use iMovie on the Mac for video editing, and Camtasia Studio on the PC. There is also an open source video editing software similar to Camtasia called CamStudio. Anyone can shoot a video and upload it to YouTube, but for a video podcast I recommend you go the extra mile. Create a custom intro, use cool transitions, etc. I'm no video pro myself, but you can study the help files or tutorials for your video editing software. You'll also find tons of tips & tricks on the web. If you are not the creative type, you can get a video intro clip created fairly easy. Just post a job request at freelance sites, or ask around for recommendations. You can also purchase a stock video - or a video theme/template to customize yourself. Search Google for "video intro theme", "video intro templates", and "introduction video clips" as a start. Once you create your first video podcast episode, you'll want to upload it to the web and start building your subscriber base. Just like with an audio podcast you'll need a host that offers plenty of storage & bandwidth - at a low price. The ideal hosting solution is Amazon S3. The PodPress WordPress Plugin, which I recommended for audio podcasts, also supports video podcasts. It will create an RSS Feed for your video podcast which you can then submit to iTunes. It will also allow you to embed your episodes into individual blog posts, which you can optimize for free search engine traffic. In addition to these basic promotion strategies, with a video podcast you'll have the added benefit of being able to submit your feed to video podcast directories. Refer back to the checklist on How To Create A Podcast for links and additional resources for setting up your video podcast. Have questions - or want to share additional tips & resources for how to create a video podcast? Leave us a comment below! This is brilliant! You have taken the mystery of video podasts and turned them into something achievable for the rest of us! Thank you for including both the hardware and software recommendations - I often find that finding the right software is half the battle. Another marketing tip for promoting a video podcast: put teaser videos on YouTube and optimize them properly for both YouTube & Google search. Use those to invite people to subscribe to your video podcast, leading them back to a page on your blog that gives them subscription options. Just want to ask a quick question, How can I get a hold of the Podcast Report if i am already subscribed through email? Looks like I'm on the right track! Does the Cannon have an external sound plug? I know Ed Dale said on IMTW that the Cannon Zi8 (which has an external jack) was a joke. What is Ed using? Yes, the Canon Vixia hf S20, S200, M30 and M31 DO have external mic inputs. Thanks for answering that question - I was wondering as well. The only concern I see in Amazon reviews is the battery life, but I generally shoot short videos. I assume it also has a place on the bottom to use a tripod. And do you recommend an extra battery, or are you finding it suits your needs fine as is? So far the battery that came with my Vixia hf M30 (almost identical to the hf s200 and s20) last's a little over 1.5 hrs (100 minutes) of "Recording" time. Playback time seems to use less battery power, so will last longer than 100 minutes. As far as getting a second battery, I'm sure I will eventually coz you can get much bigger spare batteries. However, just like you said Lynn, the videos that I've been making so far have not even come close to running the battery down. So, what was the problem with the external sound plug on the Zi8??? I don't own a Kodak Zi-8. I WAS going to guy one but I have heard Ed Dale and others say that the external mic input is of very low quality audio, which kinda defeats the purpose of an external Mic feature. I also recommend Corel VideoStudio for editing on a PC. To me, its interface is easier than Camtasia. I even edit my Camtasia videos in it! I have a Canon HG10 camcorder that I use with a Sennheiser wireless lavaliere mic setup. The HG10 has since been supplanted by the HG20. It's a very versatile "prosumer" camera and worth the $. If you don't mind an off topic question. Your email / newsletter that has links back to the blog posts. I just love how you've set that up.. How do I do the same thing? It's about time for me to be looking into podcasting and video podcasting and your articles got me thinking it's probably not so difficult as I have imagined. Thanks for the tip about the HD format. I don't usually think about format until AFTER I shoot a video. Also, thanks for letting us know about the PodPress WordPress Plugin; an RSS Feed for your video podcast which you can then submit to iTunes; how cool is that? I knew I loved wordpress. Thanks again for the helpful article. It is great to see a post on video that actually gives information on the hardware as well. Usually it is all about technique, followed by a list of tips. The hardware and software you mention is all really affordable for your average Joe. It is worth mentioning that you could also use this gear for making video testimonials which are great for any blog or site. Keep up the great work Lynn!! I have a flip that I use. It's great inside the office but it tends to pick up a lot of background noise if I use it outdoors. I am looking to start creating videos for my site and this information is very helpful to me. I had not even heard of the PodPress WordPress Plugin before so it will definitely come in handy. I have both an HD handheld camera and an Canon Vixia HF S200 video camera. My biggest time consuming problem is converting the Canon format to a downloadable and viewable format. What format is the video in and how do you transfer it? I assume via USB cable? 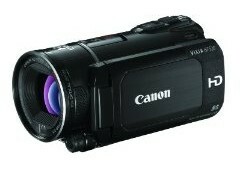 The Canon Vixia hf M30 that I have, comes with a USB cable... I'm not sure about the file type but I think it's MPEG4-AVC / H.264... And on my Mac, I have to use iMovie to open the video files and then I can do whatever I want to them. The Flip Ultra HD that I have, I can hook it up to my Mac and simply drag and drop the video files right onto the desktop, and by double clicking them, QuickTime starts playing them immediately, raw from the camera. So that's pretty cool. So far I absolutely LOVE the Vixia M30! It has "Optical" (Not that crappy "dynamic") image stabilization that is quite amazing! Glad I ponied out the extra bucks for the Vixia M30... although it's not the most expensive Vixia available. This is great stuff & so timely! I was just reviewing Camtasia for possible use on a podcast I'm planning to create. You've really captured the essence of what needs to get done! Thanks for the good info! I always use my flip cam, works for me! If i'm doing screen capture I use Camtasia! Some really good video resources listed in this post. Nice tutorial about creating video podcast. Lynn, can u suggest me any other video editing software for pc? I also have the same question, thanks. Great post! I think video is the next biggest thing for the web. I can shoot ok video, I just need to learn how to edit. A nice simple walkthrough. Very nice. Video Podcasting is being used increasingly in all different sectors - especially as sites like YouTube make it easy to share your work. P.S. might there be another post on the way about using and sharing video podcasts? any idea for the best converter for podcast? My name is Dan and I am the founder of a Philadelphia Eagles based fan blog (WordPress) and would really like to start video podcasting for my fanbase, unfortunately I have no clue what I'm doing in that department. As far as hardware I have the Flip recorder which I did see doesn't frame properly, a Konica Minolta digital camera, and a HP TouchSmart 600 PC w/ a built in webcam. Can anyone tell me which would be the best to use? I'm thinking my computer. Just set it up and make all the adjustment prior to start recording. It has a 23 inch monitor, and actually comes with a huge remote control that does have a record button on it. It sounds like it will work fine. I would test out each of your options and see which one is easiest *and* gives you the results you're looking for. I am a complete neophyte so this question may seem a bit silly to the pod-pros. I would like to create a video podcast of a presentation at a conference. According to your article, I should first follow all of the steps in your checklist for creating an audio podcast. Does this mean I should format the audio seperately (e.g. audacity) and then sync it with the video? 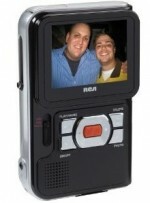 Or is it fine to just use a digital cam corder with an external mic, using only a video editing application? Thank you in advance for any insight you can provide. Thanks Lynn for the podcast info. I was wanting to set one up on my website, but wasn't sure how to do it. Thanks you very much for the insight, Lynn. Much appreciated. Video podcast are still very popular. Your HowTo is very simple and very helpful. Most people are using Amazon S3 because the hosting cost is so low for large media files. That said, I know Libsyn offers you great stats and advertising options - I'm assuming for video as well as the audio files, but you'd want to check with them on that if those are features you're interested in. Any suggestions on a tripod. I have a Canon Vixia hf r42. A lot of comments state that most of the good video tripods are too big for the small video camcorders. Also what video head? I would like to learn and do a video podcast as well as take video of speakers at a convention type setting.